Your school colors, your way! If you are a fan of Barrington, you know that our products are completely customizable. And with football season right around the corner, we are excited to announce our new Game Day Collection! You can now design your own totes and accessories in your school colors! Be creative and show your school spirit your way! One of our favorite ways to do this is with Barrington’s personalized dual bottle Westport Wine Tote. It is perfect for a tailgate or a watch party! Pack it with wine and champagne, Bloody Mary mix and vodka or whiskey and coke. To top it off, it’s designed in your game day colors, so everyone knows who you’re cheering for. Or, show your school spirit with an item that you’ll use every day. Pair a personalized St. Anne Tote with our Crosby Zipper Wallet or Kent Key Ring Wallet. If you’re a student, show your school spirit at the library or during class with our Noteworthy Book Jacket or Buchanan Laptop Case. And add a red and white stripe. From there, you can choose your favorite monogram style to add personalization. 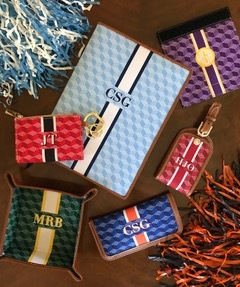 It’s so fun to play around in our Game Day Collection, because there are so many ways to create a totally customized and personalized Barrington tote with your school colors! If you have any questions about our Game Day Collection or any specific product, don’t hesitate to contact us! Here’s to a winning season! LOVED THIS ARTICLE? PIN IT!